CoVRHA dedicates this page to Colorado's NVRHA Legends. Little Bell Pepper was ridden to his Legend Award by both Henry Block of Colorado and Jennifer Sadler of Arkansas. Considered “One of the greatest versatility horses I have ever ridden.” by Jay Henson and everyone who has had the privilege of owing and showing the 2001 bay gelding. 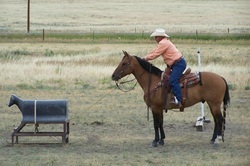 Pepper, n/k/a Cowboy, has consistently proven himself as a champion and one of the best versatility horses in the sport. (sometimes, way, way down the line) in the Conformation class.